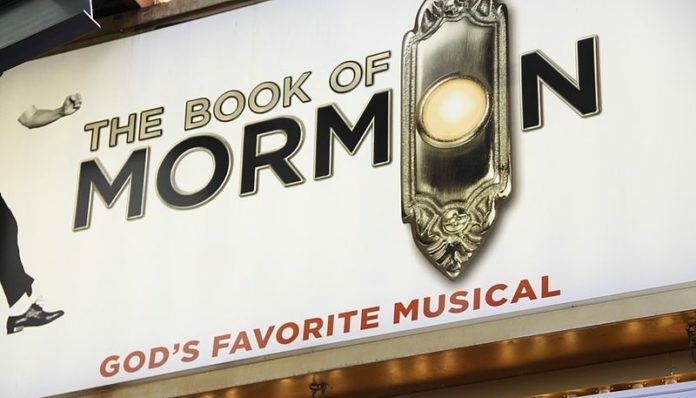 You have probably heard of the musical, “The Book of Mormon.” This groundbreaking Broadway hit shocked audiences while bringing with it barrels of laughter. The show originally opened in March of 2011 starring Andrew Rannells and Josh Gad. Written by Trey Parker, Robert Lopez and Matt Stone, “The Book of Mormon” follows the story of two young male missionaries. Where does this mission take these two poorly matched boys? Uganda. The production dramatically depicts LDS church culture versus Ugandan culture. It emphasizes the tidbits of accuracy with intelligent humor. The show won nine Tony awards in total, including the awards for Best Musical, Best Book of a Musical and Best Original Score. Since then, it has remained a hit with a continuous touring company in the United States and London’s West End. “The Book of Mormon” musical is undeniably a hit. It’s hard to keep yourself from singing along to “Turn it Off” or loudly blasting “Sal Tlay Ka Siti,” while driving through Salt Lake City. Amongst this masterpiece’s undeniable fame from the general public, there is the question of what the Church of Jesus Christ of Latter-day Saints thinks about the musical. The show makes fun of the Church, as well as Christianity in general. Many would expect the LDS population to react rather negatively to this offensive narrative about their lifestyle. “The Book of Mormon” exaggerates Church beliefs and makes fun of missionaries, but in a truly mature fashion, the Church surprised the public by making one definitive statement, “The production may attempt to entertain audiences for an evening, but the ‘Book of Mormon’ as a volume of scripture will change people’s lives forever by bringing them closer to Christ.” This response from the Church definitely showed awareness as well as a lack of respect for the show, but it also showed maturity in handling the offensive tastes of the musical’s story. Since then, the Church will often purchase advertising space in the playbills with the phrase “You’ve seen the play. Now read the book.” They found that they actually were more effective and respected through these responses. This respect for the Church has been established through the simplest of actions, but the show was not created to promote the LDS religion. So one would think there would definitely be more people turning farther away from the Church rather than closer. Actor Josh Gad, one of the lead actors in the original Broadway cast, was actually heard talking about a patron who said that the musical turned him towards the Church. Oddly enough, there have been more stories of the show bringing folks into the fold than turning them away. While on tour, “The Book of Mormon” stopped by Salt Lake City and definitely raised conversation. As ‘the Mormon capital of the world,’ having this controversial musical stay in the valley to perform was an event, to say the least. Mixed reviews popped up all over. Many voices of those who had grown up in the valley expressed their enjoyment of the show and how relatable the story was, but there were several opposers to the more optimistic view. Some individuals, usually members of the Church of Jesus Christ of Latter Day Saints (not speaking on behalf of the church) did voice their offense. Even though the songs are entertaining and the dance numbers are fantastic, there are many references, ideologies and racy material that trouble even non-members. The negative references and teasing of the Church didn’t stop ticket sales from soaring, though. According to Cami Munk, Communications Manager of the Salt Lake County Center for the Arts and Kathy Lustica, Director of Regional Marketing for Broadway Across America Mountain, every show during the residency in Salt Lake City had a sold-out house. Even with controversial views and jokes directed at the prominent religious group which founded this city, people still wanted to see this critically acclaimed masterpiece. To add to this surprising turn out, Eccles Theater will be bringing “The Book of Mormon” back. They will be here for a two-week stay, Aug. 13 through 25. I served as a missionary in Montreal Canada two years ago when the play was in town and it was pretty funny seeing the response. People started calling us from the playbill advertisements and 2 ended up getting baptized. Sure the play is filled with derogatory jokes and I felt somewhat uncomfortable walking around the metro with all the full-size advertisements mocking Missionaries dressed exactly like me but overall it was great publicity for the Church. I served as a missionary in Montreal Canada when the play was in town and it was pretty funny seeing the response. People started calling us from the playbill advertisements and 2 ended up getting baptized. Sure the play is filled with derogatory jokes and I felt somewhat uncomfortable walking around the metro with all the full-size advertisements mocking Missionaries dressed exactly like me but overall it was great publicity for the Church.